Perennial herb, 0.40-1m high, native to Europe, naturalized in North America; leaves pinnate; flowers white to pink. 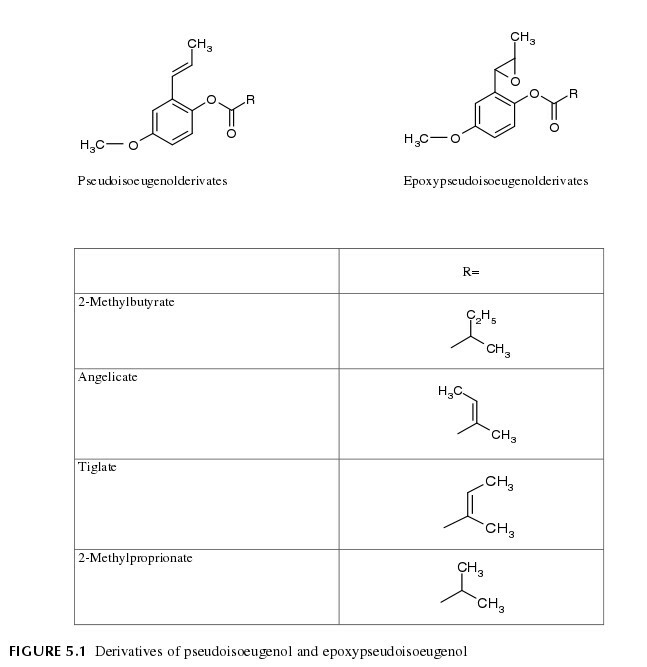 Main compound of root oil is trans-epoxypseudoisoeugenyl tiglate (19.5%), accompanied by structurally related minor constituents, such as pseudoisoeugenyl tiglate (3.4%), trans-pseudoisoeugenol 2-methylbutyrate (traces) and epoxypseudoisoeugenyl 2-methyl butyrate (traces). A number of sesqui- and tri-norsesquiterpenoids (C12-hydrocarbons) occur in appreciable amounts, like δ-elemene (12%), pregeijerene (9.7%), and germacrene-C (7.8%). Monoterpenoids could only be found in traces (p-cymene). Pimpinella magna L. (P.major, left) and Pimpinella saxifraga L.